Are you looking for professional carpet cleaning? Look no further! Chem-Dry Carpet Cleaning by Warren proudly provides professional carpet and upholstery cleaning services in Naples, Bonita Springs, and the surrounding area. We pride ourselves in helping our customers maintain a clean, healthy, happy home. Our proprietary carbonated cleaning process, combined with our green-certified, non-toxic solution will deliver a healthy clean that will last. Schedule an appointment today! Chem-Dry Carpet Cleaning by Warren is not a steam cleaner. Instead of steam, we use a proprietary cleaning solution called The Natural® which uses the cleaning power of carbonation to lift and extract dirt from deep within your carpet. Our cleaning process not only provides a superior cleaning, but it also uses 80% less water than traditional steam cleaning. So instead of soaking your carpet with gallons of water, we leave it dry enough to dry completely in 1-2 hours. This means no wet socks from accidentally stepping on your soggy carpet the next day. Whether you are looking for professional carpet cleaning, upholstery cleaning, stain removal, or pet urine removal treatment, we have the solution for you. Our proprietary process combined with our non-toxic, green-certified solution means that we'll leave your home not only cleaner but safer and healthier, too. Our professionally-trained technicians here at Chem-Dry Carpet Cleaning by Warren are dedicated to providing an outstanding cleaning experience and will treat your home and family with the respect you deserve. We have the expertise of years of service. Trust the experts and call us for your next carpet or upholstery cleaning. Click below to access our form and provide us with your contact information and any other information about your needs. Chem-Dry Carpet Cleaning by Warren will contact you soon to schedule an in-home appointment so you'll be on your way to a cleaner, healthier home! Love this company!!! I use them up north too! Reliable, honest and priced right!! My carpets look brand new!!! Thanks Phyllis & Warren! Chem-Dry Carpet Cleaning by Warren's cleaning process is better and healthier than other methods for your carpet and upholstery cleaning. Chem-Dry’s unique hot carbonating extraction carpet cleaning method uses the power of carbonation to extract more dirt and grime from your carpets, giving them a deeper and longer lasting clean. Our carbonated cleaning solution only requires us to use a fraction of the moisture other methods such as steam cleaning require. This allows your carpets to dry faster, typically in 1-2 hours. Pet odors can linger on for months if not treated properly. As urine dries in the carpet and padding, what’s left are millions of concentrated urine crystals that become even more pungent. Many companies in Naples, FL just mask this odor. Chem-Dry Carpet Cleaning by Warren uses a patented system, P.U.R.T.® (Pet Urine Removal Treatment) to explode the urine crystals and break down the enzymes which gets rid of the pet urine odor forever. 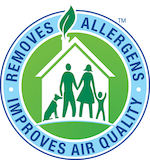 Industry experts suggest that Naples, FL homeowners clean their carpets every 3-6 months especially homes with kids, pets or if someone in your home has asthma or allergies. Regular cleaning will not only improve your home’s appearance, but it will eliminate germs and allergens, improve your home’s indoor air quality and extend the life of your carpeting. How does Chem-Dry Carpet Cleaning by Warren clean upholstery? Is Chem-Dry Carpet Cleaning by Warren a steam cleaner? Are Chem-Dry Carpet Cleaning by Warren products safe for my kids and pets? 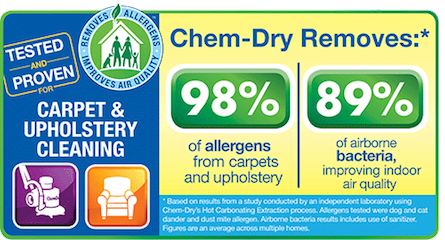 All of the ingredients in Chem-Dry Carpet Cleaning by Warren's primary cleaner, The Natural, are on the F.D.A. 's G.R.A.S. (Generally Recognized as Safe) list and are safe for your carpets, home and family in Naples. The Natural does not contain any soaps or harsh chemicals. Chem-Dry Carpet Cleaning by Warren is safe for your whole family!